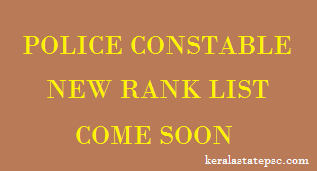 Kerala PSC rank list of Police constable/ Civil Police Officer in Kerala Police will publish soon. PSC informed that this new police list will contain almost 13000 candidates together from 14 districts of Kerala. 1000 women candidates also included. Each district's rank list will include almost 2000 rank holders. More candidates are in Thiruvananthapuram Police constable rank list. After the certificate verification the new ranklist will publish. The cut off mark of the police constable exam hold by Kerala PSC did not reveal. But the expert prediction is that it will be in between 30- 40 marks. Comparing to the previous years the competition for the post of constable through PSC exam increased. Many coaching centers were active in their way to make their students the best rank holders of the civil police officer rank list 2015. There was no change in the syllabus and qualification. It was equivalent to the LD clerk syllabus, except Malayalam. Many candidates are in hope for the job of Police constable in the Kerala Police Department. As per the tenth pay commission the salary scale of Kerala Police constable will be more attractive. So many candidates were tried out for the test. The new rank list will be a New Year Gift for the PSC aspirants from the KPSC and Kerala Government. As the next some months are last months of this government, they will try to give more opportunity for the PSC applicants. So, all the very best for the Police Constable Aspirants who are waiting for the new short list in 2016.